Hoop Dreams has haunted me ever since I saw it 20 years ago. The story of two black Chicago high school basketball players hoping to make the NBA and escape their inner-city lives, the film ends with their pro dreams very much in doubt. Decades later, I still remember the last thing William Gates, one of the two subjects, says as he begins to understand that stardom possibly isn't in his future: "When somebody says, 'When you get to the NBA, don't forget about me,' I should've said to them, 'Well, If I don't make it, don't you forget about me.'" Those words cut me like a dagger. He wasn't just talking about success and failure; he was speaking to how quickly we discard athletes once they're done entertaining us. I've never looked at sports the same since. Every star has an expiration date—even those who never got famous enough to some day be forgotten. Sports are merely exciting diversions for us, but for the athletes, they can be a livelihood, a lifeline, and a way out. Those cruel realities came flooding back to me while watching Million Dollar Arm, this week's blandly inspirational Disney drama based on the true story of sports agent J.B. Bernstein (Jon Hamm), who resurrected his career in India via a pitching contest in which the winners travel to America to try out for Major League Baseball. The film traces the exploits of Dinesh Patel (Madhur Mittal) and Rinku Singh (Suraj Sharma) as they prepare for their auditions with MLB scouts, but the movie's really about how they help J.B. become a better person who stops dating vapid models and settles down with the sassy, straight-shooting Lake Bell. That's the film's true happy ending, with the added bonus that—SPOILER ALERT!— we learn that both Patel and Singh sign contracts with the Pittsburgh Pirates, so, hey, they got something good, too. It's a common annoyance at the movies: A well-meaning, white, American character bravely lends a hand to an impoverished minority or foreigner, learning important lessons in the process. But what makes Million Dollar Arm doubly irritating is that the story's real drama is right there, except the filmmakers aren't interested in it. Imagine being an Indian kid, and you've never thrown a baseball in your life—never even left your poor village—and suddenly you have a chance to go to the U.S. and pitch in front of men who could give you and your family millions of dollars. All you'd have to endure are homesickness, jarring culture clashes, and unspeakable amounts of pressure. But Million Dollar Arm doesn't care about any of that: It's too concerned with telling us to Believe in Our Dreams. Most people will probably find the film pleasant enough—who doesn't like Jon Hamm?—but my hunch is that baseball fans are going to smell how phony it all is. Which is why, if they haven't seen Sugar, they definitely should. Like Hoop Dreams, it's honest about just how hard it is to make a career playing the sport you love. And unlike Million Dollar Arm, it asks us to consider exactly who these people are who risk everything to come to our shores to throw or hit a ball. The followup film from Half Nelson writing-directing team Anna Boden and Ryan Fleck, Sugar came to theaters in 2009 with good reviews but not a lot of buzz, in part because the movie doesn't have any stars. The title character, Miguel "Sugar" Santos, is played by Algenis Perez Soto, a non-actor whom the filmmakers discovered while scouting around the Dominican Republic looking for their lead. A former aspiring ballplayer, Perez Soto had the authenticity and just enough charisma to be believable as Miguel, a confident Dominican pitcher who gets signed to a minor-league contract with a fictional MLB team and moves in with a kind, conservative older couple in Iowa. With a dispassionate, almost documentary-like objectivity, Sugar clearly isn't meant to be your typical rah-rah sports movie. Miguel isn't trying to win the big game or conquer institutional racism; he's just trying to make the team and figure out this new country where he doesn't speak the language or understand the customs. With Half Nelson, Boden and Fleck told a more realistic version of the inspirational-teacher drama; here, they're undercutting the traditional inspirational-athlete film, looking at one of the many foreigners who gets a chance with an American team, but it might not pan out. Consequently, Sugar is one of those rare sports movies that feels like it has real stakes, not artificial ones amped up by the filmmakers. For instance, in Moneyball, Billy Beane's aborted athletic career simply becomes part of his dramatic back story: Will he be defined by his past failures? But Sugar understands that a guy like Beane is actually pretty lucky: He'll always have other opportunities to make a living, even if it isn't directly playing the game he loves. Miguel isn't so fortunate. Living in relative poverty—his dad died years ago—he has very few options outside of baseball. Getting cut won't be some dramatic character-building obstacle he'll have to wrestle with: It's a devastating blow to his vision of the future. The filmmakers don't romanticize Miguel: He's a bit temperamental, and some of his minor-league struggles arise from his unwillingness to match the heightened athleticism of his new teammates. But Sugar is clear-eyed about the unfeeling machinery that attracts and scoops up these local Next Big Things, offering them hope in the big leagues, but also unconcerned with cutting them loose if it doesn't work out. The movie doesn't get weepy about this—it understands that baseball is a business—but its lack of sappiness only makes its hero's slow, steady decline all the more depressing. Nobody—not the attentive family who's hosting him, not their sweet granddaughter (Ellary Porterfield) who develops feelings for him—can do anything to help him, and no inspirational speech is going to turn his fortunes around when he gets injured and discouraged. Although the film is heartbreaking, Sugar isn't pitched as a tragedy because, really, Miguel is just one of many in this situation. Nobodies get cut all the time; we just don't think about it. Million Dollar Arm is based on a true story, but Sugar is the more realistic film. Last month, much was made about Los Angeles magazine's feature recounting Yasiel Puig's remarkable, harrowing defection from Cuba. 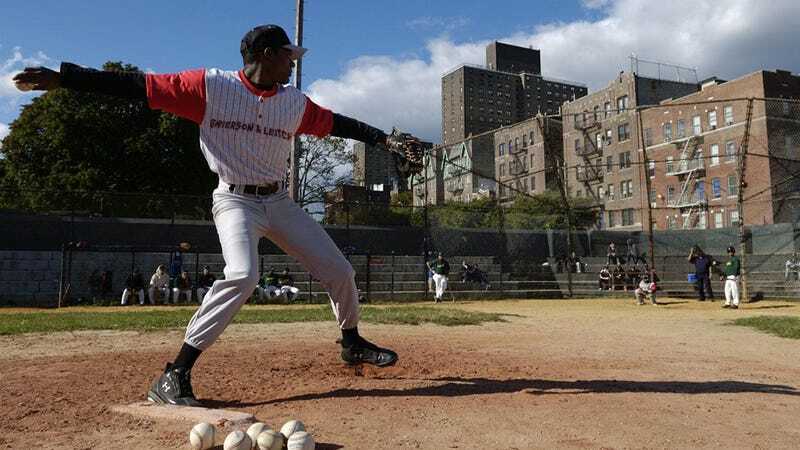 It's an amazing story, but a movie like Sugar reminds us that the struggles foreign-born baseball players face, though rarely as frightening, aren't that uncommon. We know Puig's story, but let's not forget about all the others who never make The Show.